If you’ve been wondering what the replacement for the Nissan Altima is going to look like, we think we might have something that will interest you. At the 2010 Los Angeles Auto Show today, Nissan unveiled its Ellure Concept, a front-wheel drive sedan that hints at future models. It’s probably safe to assume that Nissan wouldn’t have built the Ellure unless they were going to get some kind of production vehicle out of it and the Ellure fits the Altima mold. The press release for Nissan‘s Ellure concept invokes the name of the sacred Datsun 510, but while the 510 was a diminutive, boxy sports sedan, the Ellure is swoopy and musculer, like a futuristic Maxima. 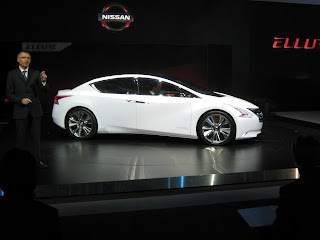 With a front end supposedly inspired by the formal coat worn by Samurai, Nissan asserts that the Ellure makes no attempt to hide its “sedan-ness”, mentioning that they expect this body style to be the core of their future product lineup. Naturally, the Ellure is a hybrid that uses a supercharged 2.5L four-cylinder, a CVT transmission and a 25kw electric motor.